CBS is no newcomer when it comes to experimenting with giving their audience a more interactive experience with their television programming. As I’ve discussed elsewhere on this blog, the television network in the past had offered their audience a chance to engage in social interactivity while watching their favorite shows online. The network had structured online spaces to become chatrooms wherein viewers could congregate and talk amongst themselves while watching the show — and earlier versions of these virtual living rooms even permitted the viewers to superficially engage with the content via reactions and trivia. Since that time, CBS has developed a new way for people to engage in similar activities. They created CBS Connect to build on existing social media structures, thereby providing people the ability to follow their favorite shows via Facebook and Google+, and to comment on shows via Twitter. Utilizing Twitter makes it easier for CBS to follow and collect comments related to their content through hashtags and keyword searches, but it does reduce the type of social interaction found in their earlier chatrooms unless people reply or retweet. Additionally, CBS Connect allows fans to be kept informed of upcoming events and to have some behind the scenes information about their favorite stars and shows. Perhaps not content to leave it with the basic online social media, CBS Connect is also an app available for iPads (sorry, Android users, nothing for you at the time of writing). The app takes the interactivity with the CBS programming a step further. 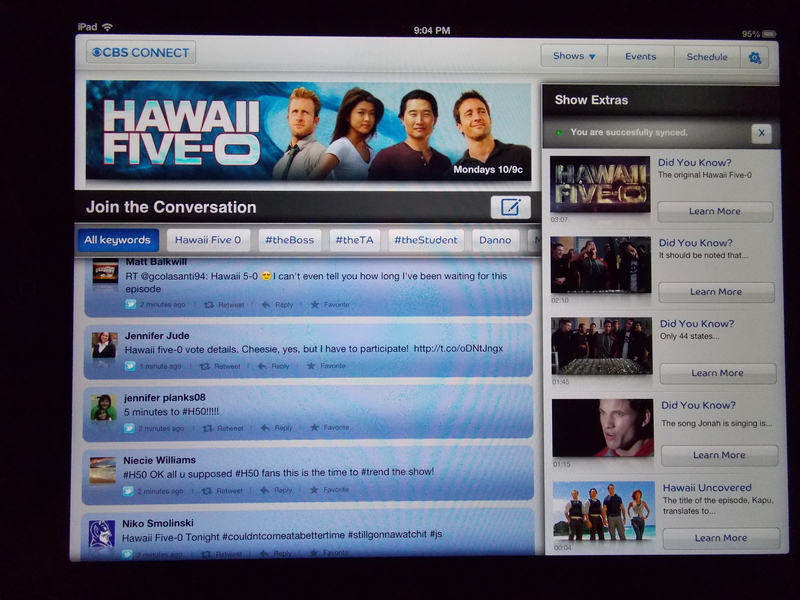 Utilizing the concept of the “second screen” that is becoming increasingly common from proponents of “social tv”, the app allows you to sync your iPad with the television show as it airs utilizing the built-in microphone (as seen above). What this means is that as you watch the show, the tablet is listening to the show along with you. The app uses the sound from the show to determine when specific interactions are possible. These interactions include background information on the stars and the show, trivia and quizzes, as well as content intended to extend what is happening in the show to provide the viewer with a further experience with the show. For example, I am not a CBS person, but I had heard about an event CBS was doing with their relaunched series Hawaii Five-O. 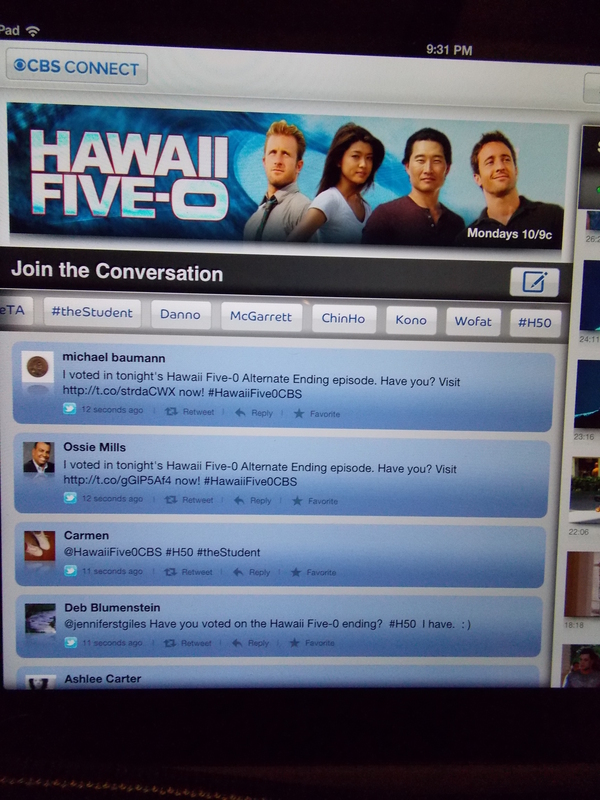 This past Monday (1/14/13), they allowed viewers of the show to vote on how they wanted the episode “Kapu” to end: viewers were encouraged to take to Twitter or use the website (as seen below) to vote for whodunnit for the night’s murder investigation. In a sense, then, the network was experimenting with content interactivity: they were allowing the viewers, in aggregate and in real time, to decide how the content would end by choosing between three alternate endings. CBS did this twice that Monday night: once for the East Coast (and CST) viewers and once for the West Coast (and MST) viewers — and, according to CBS, the two voting opportunities resulted in different endings. Now, given my interest in interactive television, I sat down to watch this episode. The first thing I did was install the CBS Connect app and sync my iPad to my television set. As the hour progressed, the app had two major features. First, and what appeared to be primary given the amount of space dedicated to it, there was a constantly updating Twitter feed that largely did four things: revealed who people were voting for, had viewers encouraging others to vote, had viewers espousing on their love of the show, and had their reactions to the episode as it progressed, which included their reactions to who the crowd had decided was the killer. 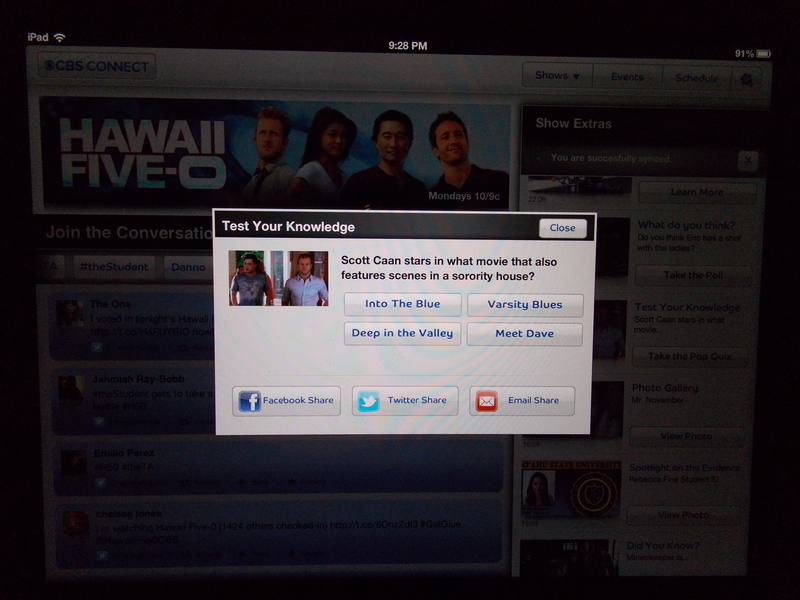 Second, running in a column along the left side of the screen, were the interaction activities that were synced with the episode. These activities were primarily of four types: trivia, quizzes, behind the scenes, and expanded content. Each activity became active in this column to match up with what was happening or had just happened on the episode. The last category, called “Spotlight on the Evidence,” was particularly interesting as it provided viewers more access to the content of the episode; given that it is a crime drama, this meant allowing the viewers to interact with evidence from that investigation. We have seen this type of expanded experience used asynchronously for other content, such as providing games and stories online for television viewers and moviegoers. But with this “second screen” capability of syncing to the broadcast, the expanded experience could be had synchronously, perhaps further immersing the viewer in the world of the show. 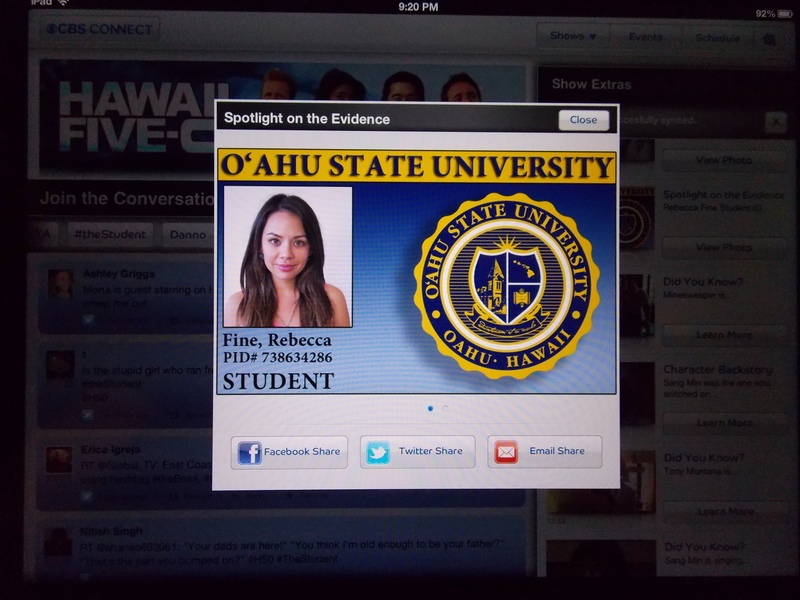 Now, such activities would be available for other shows and other episodes, not just this special Hawaii Five-O event. And such activities are superficially content interactivity, as they do not allow the user to actually have input over the progression of the show’s content. This night’s special event was special because it was true content interactivity, even if the show was not responsive to the users on a one-to-one, individualized basis. As the night progressed, more and more people voted. According to Mike Proulx of the blog Harmonic Aftershock, some 7,200 tweets contained the hashtags for voting for one of the possible killers during the time I was watching, which was the East Coast airing; there is no word from CBS as to how many voted via the website. 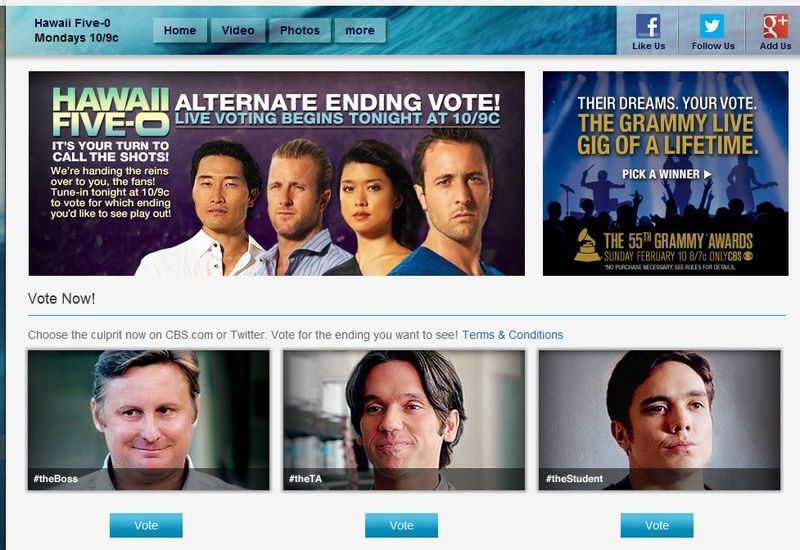 During commercial breaks, interstitials would remind viewers to go online and cast their votes for whodunnit. About halfway through the episode, at least on the Twitter feed I was seeing via CBS Connect, the voting did die down as comments turned to reactions to what was happening on the episode. Thus went voting until it was closed with twenty minutes left in the hour. At thirteen minutes left in the hour, Danno announced in the episode — through the device of calling his colleagues — that they know who the killer is, and that his colleagues are not going to believe it. 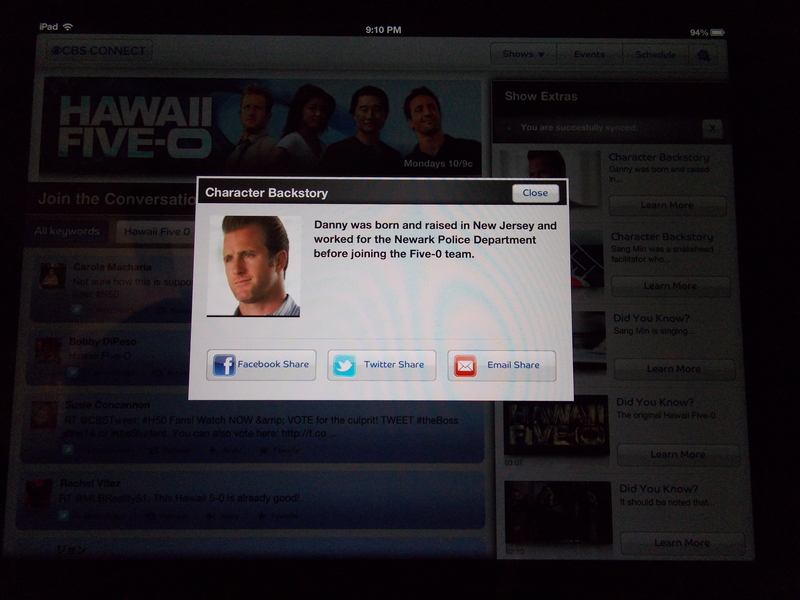 From what I followed in the show, Danno and the guys (and I mean the guys, as the only female colleague in the episode was babysitting a criminal in a B story line) were looking to see who had hacked an email, and whoever did that was the killer. This plot device made it easier for it to have been any of the suspects the viewers could vote for: it was an easy launching point to show one of the three alternate endings. And then there was a three minute commercial break. I kid you not. My guess is that they needed to verify the counts and get the right “ending” in place for broadcast. When the episode returned from commercials, it was announced that “The Boss” was the killer, and a brief run through the forests of Hawaii was shown as they captured him before he killed again. Basically, the “alternate ending” was a 2-3 minute scene as the remainder of the episode’s time dealt with wrapping up the episode’s B and C story lines. But if you are interested, you can catch all the endings at the website. They are all the same in terms of what happens, with the only difference being who is doing it. I will not say any more, lest I spoil the experience. Basically the same story beats and dialogue occurs, just with a different name and character inserted at key moments, like a weak Madlib. The three alternate endings were not at all as original as the three endings for the film Clue, which went out of its way to give wholly original conclusions to the comical murder mystery. The viewers’ reactions to the chosen ending were also fascinating. Some seemed upset with who the majority voted for, such as this quote “Come on america the boss is so predictable let down.” Others seemed vindicated, as they chose along with the majority: “I knew it was #theboss I could work for hawaii five o.” Overall, the show performed better than average, bringing in over 9 million viewers during the night; however, it wasn’t the highest performing episode to air to date. And, according to Proulx, it wasn’t even the episode to generate the most Twitter traffic. However, it must be said that CBS was really experimenting with what it could do to create synchronous content interactivity with such a massive audience. For the most part, such experiments have been smaller scale, and usually associated with various academic research projects. Here was a commercial attempt to create such content interactivity with a drama that required the network to have the alternative prerecorded clips ready for broadcast as soon as the voting was tallied — a turnaround that meant only a matter of minutes rather than hours or days. It could be that other commercial ventures may pick up where academics have been treading by creating databases of prerecorded clips that could be edited together based on viewers’ votes to create a coherent episode. And if such a database was accessible not via over-the-air broadcasting but by online streaming, the content interactivity could be individualized, producing that one-to-one feeling we now get from playing a digital game and deciding what happens through our gameplay. But such a roll out of more content interactivity will most likely not happen quickly, given the requirements for amassing a database of accessible prerecorded clips and creating the algorithms for it being responsive to either aggregated or individualized voting. 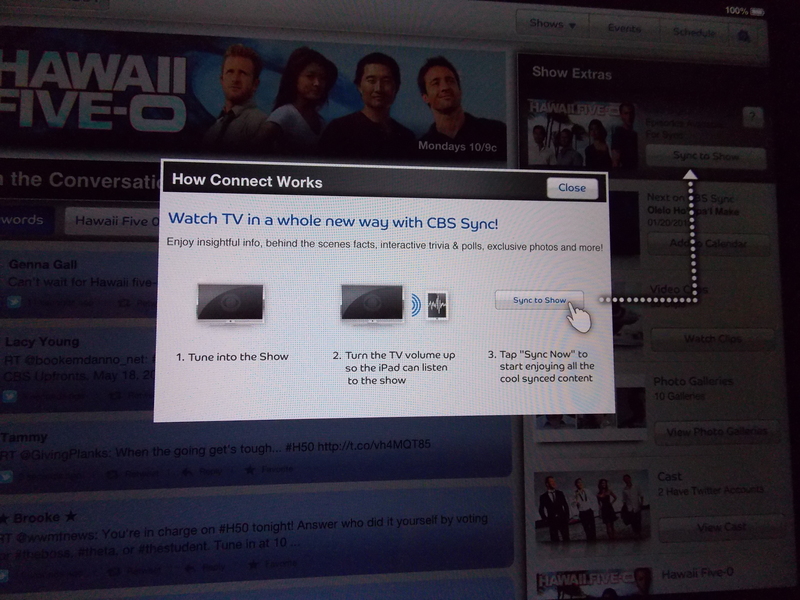 What is most likely to advance first is the type of interactions seen in the “second screen” of CBS Connect. If more people are willing to sign on to the types of social interactivity provided for by “social TV,” then media producers may be more likely to invest more in what is needed to make true content interactivity a reality.